Meatballs ~ In an Airfryer! ~ When The Hubby Cooks! December and January saw a lot of family fun – barbecues and more barbecues saw us trying out various short eats at home. Sometime last month Roshan tried making these meatballs on a whim. He wanted to actually make them for the kofta curry that he had in mind, but the curry flew out of the window as the meatballs were so delicious that they hardly survived 10 mins after coming out of the airfryer. Ah, that’s another story I have to tell you. January was also the time when our family friends Shamin & Roshni Sequeira drove down all the way from Oman with their family to spend New Years with us and they gifted us this lovely airfryer from Philips which we simply love to experiment with (thank you so much guys!!). From spring rolls to idlies to kebabs to meatballs it just about fries anything with little or no oil. Fabulous ain’t it? The week after we got the airfryer we must have used it umpteen number of times especially because cooking durations are simply slashed down in this apparatus. The best part about the airfryer is that you can preheat it, pop your food in it and set the timer and temperature and go on with your other chores. Unlike the traditional deep frying method which calls for so much oil and needs your undivided attention the airfryer is definitely a healthier option. 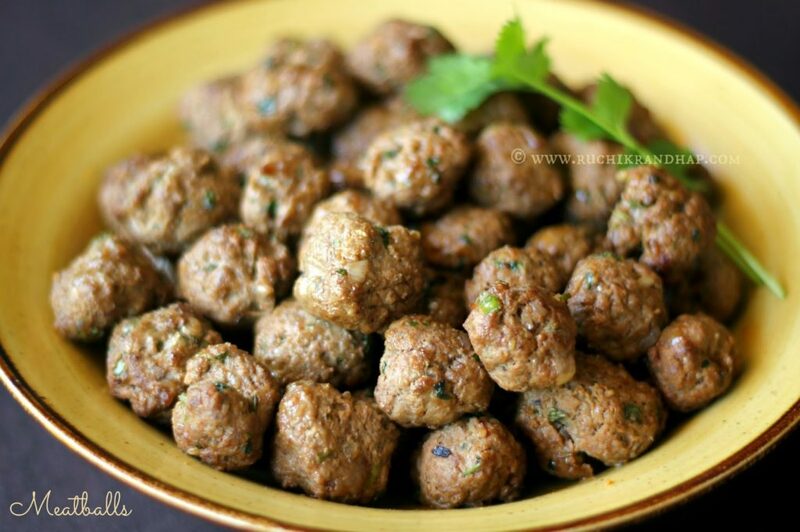 If you don’t have an airfryer you can still make these meatballs and use them as required. 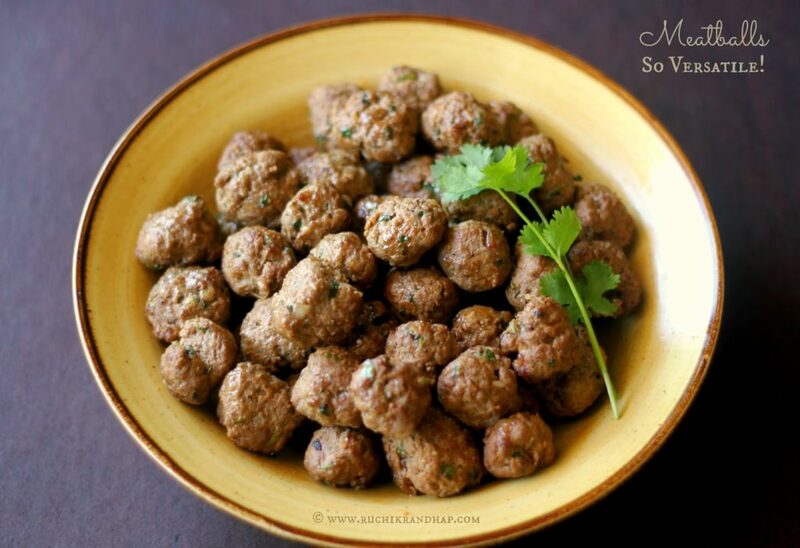 They are great as a party appetizer or to be added to pasta or curries or as finger foods to little ones – its a one time job to make them as you can always freeze them and use them later. So do make them wontchya? 3. I fried the meatballs in my Philips Airfryer – preheated the airfryer at 200 C for 7 minutes and fried the meatballs brushed with a few drops of oil for about 7-8 minutes. Halfway into the frying time remove the fryer basket out and shake it a little to ensure even cooking/browning. As my fryer basket is small I fried about 22-24 meatballs per batch. The subsequent frying sessions took approx 7 mins to cook. 1. If you don’t have an airfryer you can also bake the meatballs in a regular oven. Preheat the oven to 220 degrees C and bake for 17-18 mins or till done. The baking time will vary depending on the type/size of the oven so keep a watch. The meatballs should be light golden in colour. Compliments to your husband for creating such a masterpiece that is so evident. Wonderfully prepared. I recently purchased an air fryer and have used it for frying chicken and nuggets in them. 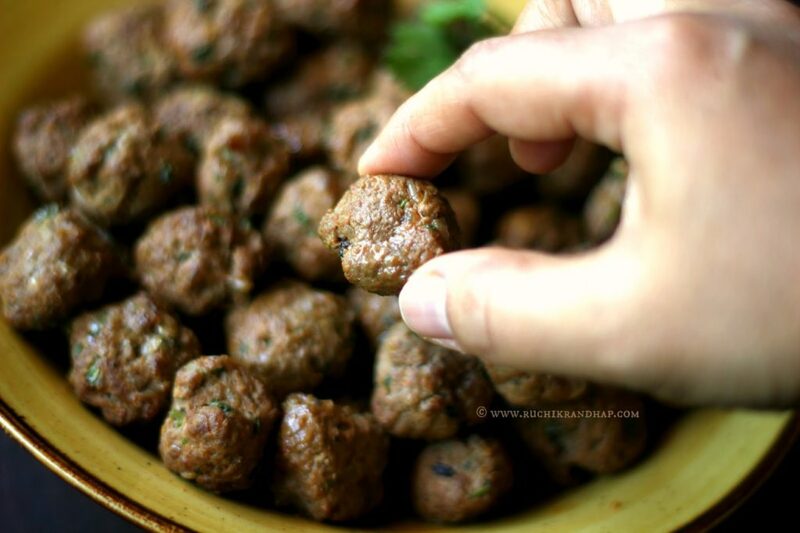 Definitely looking for more ideas and these meatballs sound really interesting… bookmarked! @ Deepa, Rafeeda and Julie: Thanks so much! Do give it a try, it tastes great and is really quick if you have an airfryer! Thanks shireen for your prompt and detailed reply. Really appreciate the effort. Will try it out.